Refectocil Chestnut Especially trendy is the matching of eyebrows with hair in Auburn/Chestnut tones using the new color RefectoCil Chestnut. This is a Beautiful Reddish Brown color, very true to it’s name. Beautiful Color!!! Depending on the length of time you leave the tint on the eyebrows will determine the depth of the color. Also available in Black, Blue/Black, Deep Blue, Violet, Natural Brown, Light Brown, Grey, Red & Blonde Bleaching Paste. Color lasts approximately 6-8 weeks and yields 20 treatments per tube. Refectocil Grey / Graphite Eyebrow Tint — For Shining Eyes at any age! Refectocil Gray is suitable particularly for eyebrows turned Grey. This shade discreetly covers Grey or White hair evenly and gives it a light Grey to dark Grey tone – “Depending on the application time”. Also available in Black, Blue/Black, Deep Blue, Violet, Natural Brown, Light Brown, Red, Chestnut & Blonde Bleaching Paste. Color lasts approximately 6-8 weeks and yields 20 treatments per tube. It is RECOMMENDED to use the 3% Premium GEL Developer with Grey as it covers Grey, White, Coarse, Resistant Hair and can be used on normal hair as well. 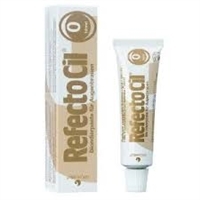 Refectocil Lt. Brown Eyelash and Eyebrow Tint — Regularly used for your Blonde haired clientele — For Subtle Enhancement! Refectocil Light Brown is suitable to discreetly emphasize Light Blonde to Light Brown eyelashes and eyebrows, if Refectocil Natural Brown is felt to be too dark. Also available in Black, Blue/Black, Deep Blue, Violet, Natural Brown, Grey, Red, Chestnut & Blonde Bleaching Paste. Color lasts approximately 6-8 weeks and yields 20 treatments per tube. Refectocil Natural Brown Eyelash and Eyebrow Tinting — Refectocil Natural Brown Tint is suitable for clients with natural brown hair who prefer a particularly natural appearance or for clients with dyed dark brown hair RefectoCil natural brown is ideal to match the brow color with the hair. Also available in Black, Blue/Black, Deep Blue, Violet Light Brown, Grey, Red, Chestnut & Blonde Bleaching Paste. Color lasts approximately 6-8 weeks and yields 20 treatments per tube. VERY IMPORTANT: DEPENDING ON HOW LONG YOU LEAVE THE COLOR ON THE EYEBROWS, WILL DETERMINE HOW DARK THEY GET. IF YOU MAKE THE EYEBROWS TO DARK, APPLY THE STAIN REMOVER WITH A Q-TIP TO THE BROWS, WAIT A FEW MINUTES AND THEN WASH CLEAN. THIS WILL LIGHTEN UP THE BROWS. MUST BE DONE IMMEDIATELY FOLLOWING THE TINTING – WILL NOT WORK THE NEXT DAY! Refectocil Pure Black eyelash and eyebrow tinting color is “Richer & Deeper” than ever before – RefectoCil pure black tints make lashes appear longer and more voluminous. With this color you can enhance the eyelashes and eyebrows. Also available in Blue/Black, Deep Blue, Violet, Natural Brown, Light Brown, Grey, Red, Chestnut & Blonde Bleaching Paste. Color lasts approximately 6-8 weeks and yields 20 treatments per tube. Recipe for mixing tint is 1/4″ tint and 3 – 6 drops of peroxide – MIX to a creamy (Frosting Like) consistency and apply to brows and lashes.